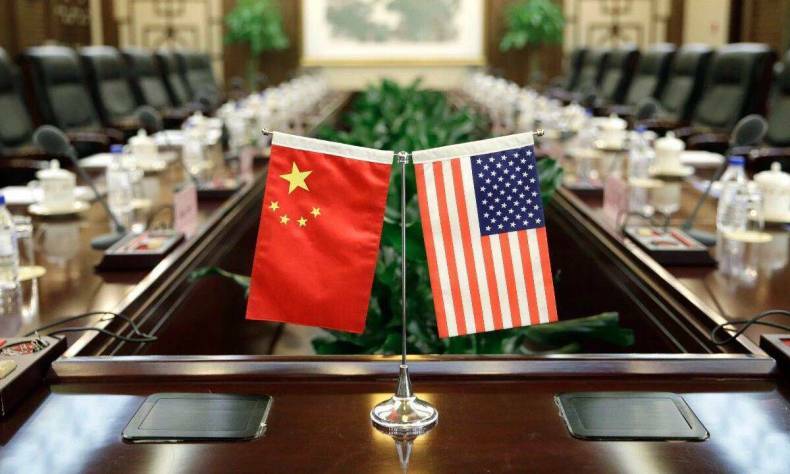 Sino-US trade relations entered a difficult period after US President Donald Trump signed a presidential memorandum on March 22 authorizing USTR to impose tariffs on $ 50 billion of imports from China, despite warnings from US business groups and trade experts not to do so. 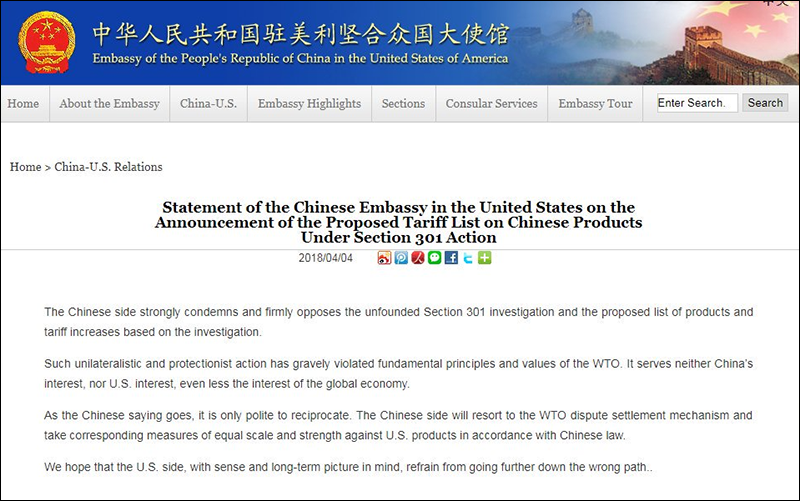 In response to an earlier US tariffs on steel and aluminium, China suspended tariff concessions on 128 items of US products including pork and fruits starting from April 2, according to the Ministry of Finance. On April 3, USTR announced the checklist of over 1300 items from China subject to 25% tariffs, with a volume of $ 50 billion. ▲On April 4, the Chinese government announced 25% tariffs on 106 products from the US, with anequal volume of $ 50 billion, as a strong countermeasure, only 11 hours from the USTR announcement. On April 5, US President Trump asked USTR to consider an additional $ 100 billion of imports from China, subject to tariff measures. On April 6, the Chinese Ministry of Coomerce and Ministry of Foreign Affairs reacted strongly, pledging to fight to the finish if the US launches a trade war. China does not want a trade war and stands for addressing the trade dispute with the United States through dialogue and consultation. But if the US insists on starting a trade war, China is ready to take any necessary measures to defend its legitimate interests. So how should China hit back faced with the worsening China-US trade relations? 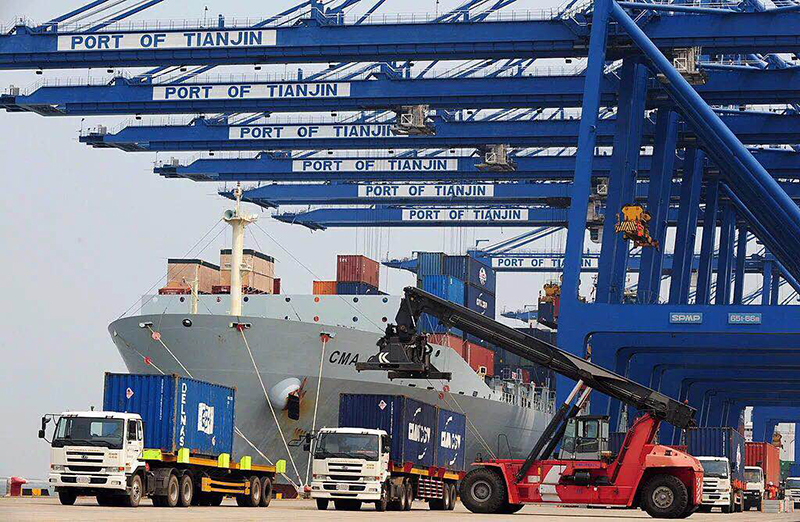 The general level of Chinese tariffs has decreased from 15.3% on China’s entry into WTO, to 9.8% today. If we take process and trade structure into consideration, we will find that China’s trade-weighted average tax rate is only 4%, very close to the developed countries’ 3%. China has acted to reduce its taxes in recent years, thereby fulfilling or in some fields surpassing commitments made to all members of WTO. Moreover, it is simplistic to compare the respective values of imports and exports, and the real deficit in China-US trade has been overvalued by statistical analysis. Intermediate trade has grown rapidly and even dominated the global value chain in recent years, with many countries involved. The export of traditional end products is, to a large extent, being replaced by intermediate products. Among the products that China exports to the US, many core components are imported from the US, the European Union, Japan and South Korea. China makes only limited profits from processing the products, but the trade deficit calculated by the US customs conceals this fact. Why does the US Focus on Trade? The original rationale behind the Trump Administration’s trade war was to rejuvenate the US manufacturing industry. 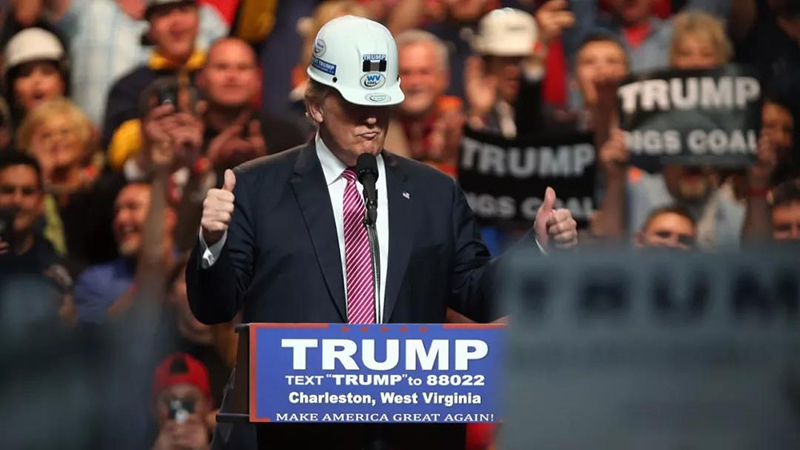 Trump made this a key pledge during his election campaign, and he blamed Chinese imports for the closure of many American manufacturing industries and the decline of the whole American manufacturing industry. This attracted many votes from blue-collar workers. In fact, the idea that American manufacturing industry can be revived through a trade war is no more than Trumpist fantasy. An analysis of the US industry structure shows that the service industry is well-developed in the US, providing the majority of American jobs. In 2017, the US achieved a new employment rate record, with almost full employment. It is not easy for people engaged in services to shift to manufacturing, far less to bring multinational corporations back to the US. The main trigger for the trade war is the decrease in common ground where the two nations can cooperate. First, with the decline in global terrorism, the US considers there is a lower security threat, hence the two nations have less need for cooperation on anti-terrorism. Second, the complementary aspect of the China-US trade relationship is changing. Following the financial crisis the American economy has revived, achieving almost full employment. This also makes the need for cooperation less urgent. China-US industrial competition has become more transversal. 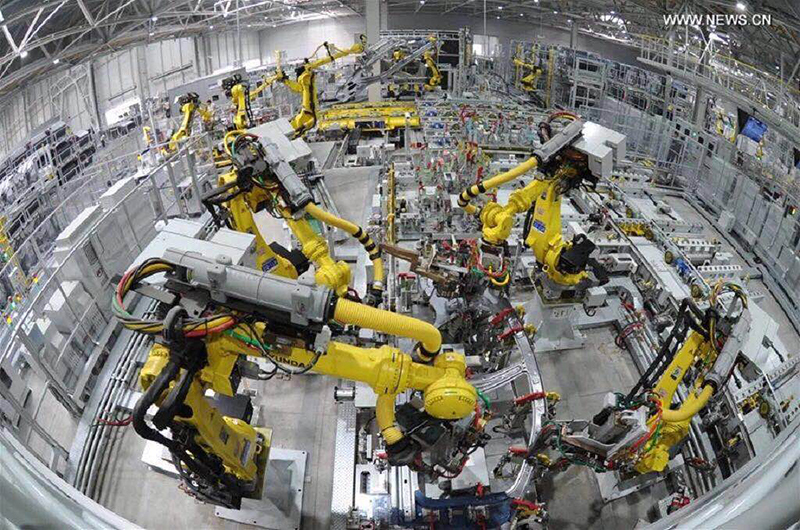 China’s industry structure has shifted from labor intensive to capital and technology intensive; while the American advantage in high-tech is shrinking. As the fields of common competition expand, competition becomes fiercer. The consequences are that American multinationals are finding China’s trade and investment environment less attractive; China’s emphasis in foreign investment is gradually changing from quantity to quality; multinational corporations have complained about the change in China’s foreign investment policy because preferential treatment for foreign investment has been abolished, and they said that the Chinese government is doing less to help them. When China entered the WTO, some American politicians saw this as an opportunity to inject China with western ideology through trade and change China’s socialist political system – a forlorn hope. After 16 years, the complete failure of this plan is apparent. Yet America’s “anti-China” voice is still loud, and the United States is constantly revising its policy to China. Since America cannot beat China in trade, it has initiated a trade war. China’s Belt and Road Initiative has provoked fears in the US that it will give China control over the whole Pacific Ocean and countries. Although the United States has not overtly opposed the initiative, it has lent no active support either. Some Americans are now concerned that it is not China’s political system that will be undermined by trade with America, but its own. They therefore see the need for a final ideological showdown between the two countries. 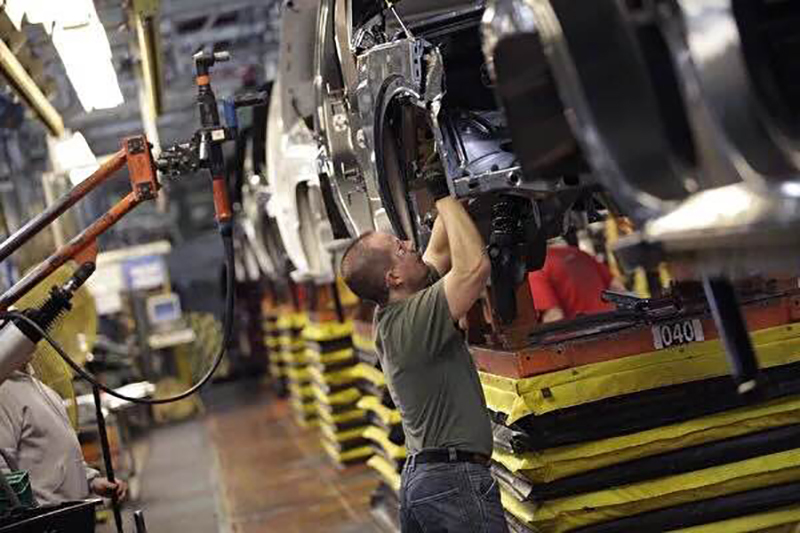 The Made in China 2025 industry development plan is very likely to see China catching up with the US and become the new leader of world economy. The main concern of Americans for China is that Made in China 2025 will result in import substitution and technology transfer of high-tech products in the United States. China is starting to threaten the global dominance of the United States in manufacturing, and the United States is trying to block China’s high-end manufacturing sector through tariffs on imports from China in areas such as high-performance medical devices, biomedicine, new materials, farm machinery and equipment, industrial robots, a new generation of information technology, new energy vehicles, aviation products and high-speed rail equipment. Trump’s trade war is an attempt to impede China’s economic development by replicating the US-Japan trade war of the 1980s, but China today is not like Japan in that period.